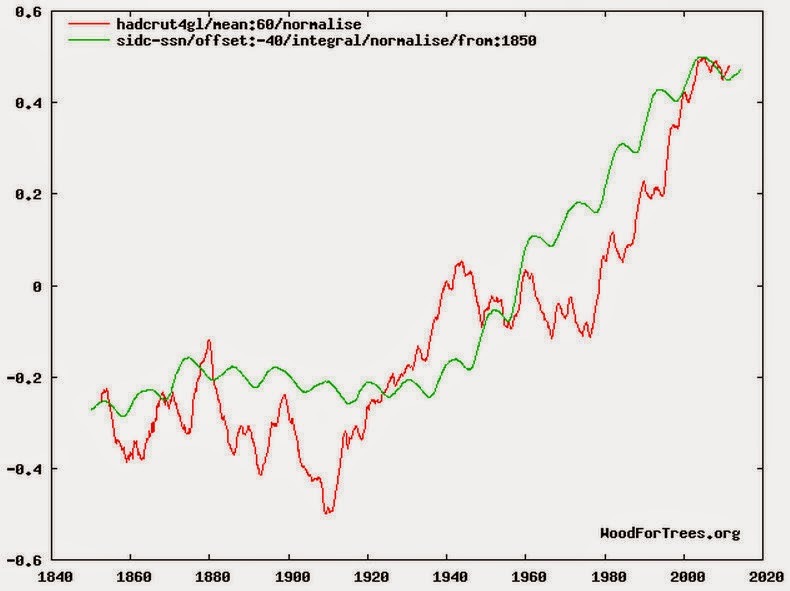 Warmists allege CO2 must be the cause of the 0.7C global warming recovery from the end of the Little Ice Age in 1850, because they claim there isn't any other plausible explanation. The Sun and solar amplification mechanisms are dismissed as a cause because sunspots peaked around 1960, even though sunspots remained at relatively high levels, considered as the solar grand maximum of the late 20th century. The accumulated solar energy [sunspot time-integral] continued to increase until the end of the 20th century along with global temperature, and then both started to decline after peaking in ~2000. Sunspot time-integral [normalized] shown in green, global temperature anomaly shown in red. Plot here for yourself. Clearly, there is no relationship between accumulated solar energy and temperature, so it must be man-made CO2. My only problem with the above analysis is that Hadcrut is an adjusted temperature set. We know temperatures were higher in both the USA and Australia (and most likely elsewhere) around the 1940's and colder in the 70's. Take the adjustments out, and there is no longer a correlation !! I don't disagree with the overall conclusion but your methodology is not correct. You cannot run a line through a graph like sunspots that is obviously quasi-periodic. Why not try integrating the curve? Frank, that is the integral of sunspot numbers in the second graph. It is not "running a line through" the sunspot numbers.